LAS VEGAS (WTVD) -- ACC champion Duke is a No. 2 seed, but the Blue Devils are the favorites to win the NCAA tournament at multiple Las Vegas sportsbooks. The Wynn and Westgate SuperBook each installed Duke as the favorite at 5-1 on Sunday afternoon after the bracket was released. William Hill's Nevada sportsbook, however, lists North Carolina as the favorite at 13-2, and MGM's sportsbook has Kansas as the favorite at 6-1. At the Westgate, North Carolina is right behind Duke at 6-1, followed by Kansas, Kentucky and defending national champion Villanova, which are each listed at 8-1. Gonzaga, the No. 1 seed in the West Region, is 10-1. Kansas, Villanova and North Carolina are the other No. 1 seeds. Duke is a No. 2 seed in the East Region. The Blue Devils began the season as the consensus favorites to win the national championship but were hampered by injuries and suspensions to key players. They twice went through stretches of losing three of four games, including in the final two weeks of the regular season. Heading into the conference tournament, the Blue Devils were not listed as the national title favorites at any of six prominent Las Vegas sportsbooks. But Duke's uneven season didn't deter the money on the Blue Devils. 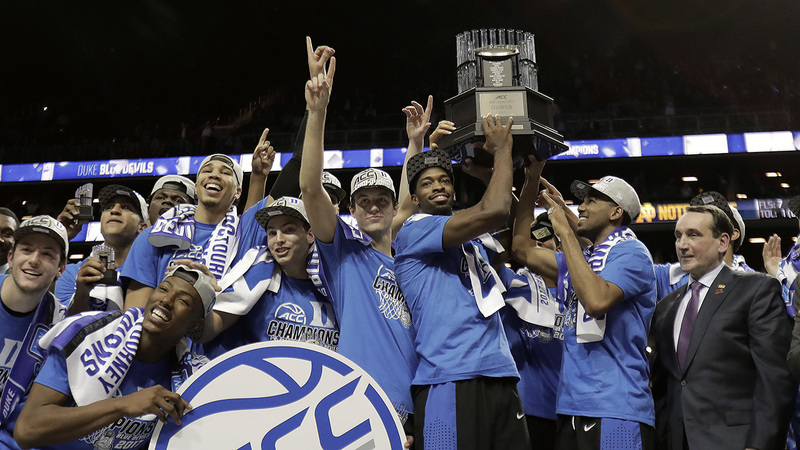 More money was bet on Duke to win the national title than any other team at the SuperBook, more than double the amount bet on Kentucky, which attracted the second-most money. The book at the South Point casino took two $10,000 bets on the Blue Devils from the same bettor in the past few weeks. "They won't stop betting it," Ed Salmons, assistant manager at the SuperBook, said of the action on Duke. Louisville, Arizona and UCLA are each listed at 12-1 at the SuperBook, followed by Oregon at 25-1. Jay Bilas, Jay Williams, Seth Greenberg and Rece Davis make their picks for the Elite 8, Final Four and title game picks that features both shades of blue from Tobacco Road on numerous occasions. Rece Davis is shocked to see Duke, which he feels is the strongest No. 2 seed, placed in the same region as defending national champion Villanova. Forget first-round upsets - bracket pools are won by correctly predicting the national champion. So let's narrow down the field of 68 until we figure out who will be cutting down the nets in Arizona.